Twenty-five people, most of them U.S. military veterans, were arrested while laying flowers at a war memorial in New York City October 7. They were engaged in a peaceful vigil to honor those killed and wounded in war and to oppose the U.S. war in Afghanistan as it entered its 12th year. The vigil was held at Vietnam Veterans Memorial Plaza in lower Manhattan and began with a program of music and speakers including Vietnam veteran Bishop George Packard, Pulitzer Prize-winning war correspondent Chris Hedges, and Iraq combat veteran Jenny Pacanowski. At 8:30, the protesters began reading the names of the New York soldiers killed in Vietnam who are commemorated at the plaza and the military dead in Afghanistan and Iraq. At 10:15 p.m., the police informed the group that the park was officially closed and that if they remained they would be arrested. Many chose to continue reading names and laying flowers until they were handcuffed and taken away. 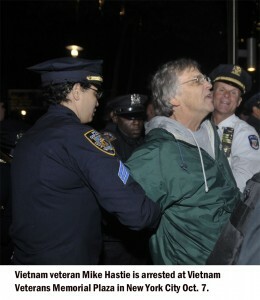 One of the arrestees was Word War II Army combat veteran, Jay Wenk, 85, from Woodstock, NY. “As long as we keep exposing the truth about these wars, then these people will not have died in vain,” said VFP board member Tarak Kauff. Veterans For Peace was founded in 1985 and has approximately 5,000 members in 150 chapters across the U.S. VFP has official “Observer” status at the United Nations, and is the only national veterans organization calling for the abolition of war.